When it comes to male-dominated professions, construction is one of the first careers that come to mind. With a total workforce of just 9% female and only one woman for every 1,000 workers on a job site, the industry comes off as a heavily disadvantaged space for women. There are numerous reasons for this glaring gap in female inclusion, from the lack of resources for women and gender bias in the recruiting process to overall social perceptions that construction is not a viable career for girls and young women. In spite of these challenges, women are increasingly breaking glass ceilings in the industry. As the labor shortage of construction workers rises to over 1.6 million people over the next five year, companies and firms are taking steps toward recruiting and retaining women. This presents an opportunity for more females to enter the field, offer their unique perspectives, and make an impact on both their careers and the industry. According to Randstad, a woman was promoted to a senior position last year in nearly one in three companies. So, who are these women that are leading construction? 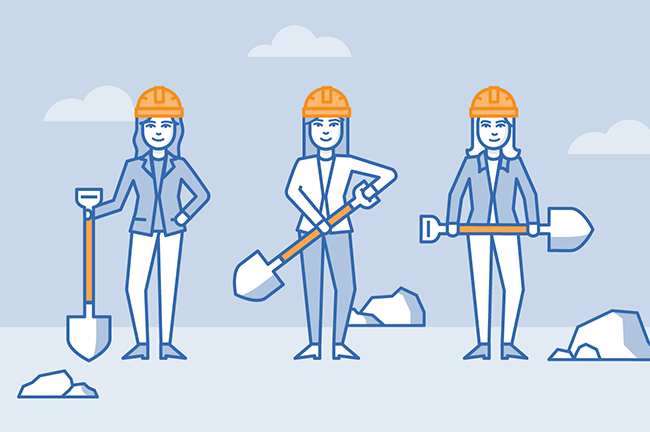 BigRentz took a closer look at the backgrounds of female leaders from the top companies to see how they changed the mold of the average construction worker and rose above the industry. Check out their findings in the infographic below.